Nothing says summer like this La Renaissance classic! 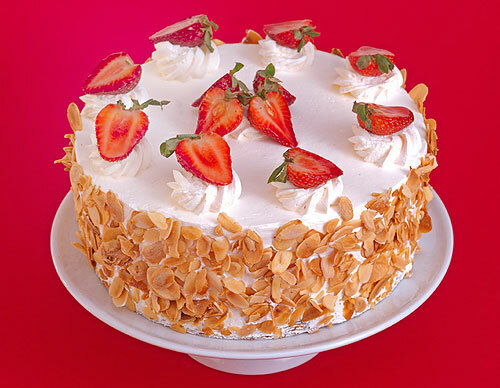 Our tender vanilla génoise is layered high with sweet, summery strawberries and fresh whipped cream, and then iced with more luscious whipped cream and dressed with slivered almonds. Once they get a load of this on the picnic table, everyone will be sure to save room for dessert. Today through July 12, you can get a special deal on our Strawberry Shortcake. Simply mention that you read about it here, and we’ll give you 20% off a 6″ or 8″ Strawberry Shortcake (regularly $28 and $38, our 6″ cake serves 4-6, and our 8″ cake serves 8-10). Need a larger size? We’ll share the discount on those, too!